A very large audience packed St Clement’s Church, Neyland last Thursday evening for a very special concert. Two choirs came together to go through a really delightful programme. They were Voix de Losa from Sanguinet, from Nouvelle-Aquitane, south-western France and Neyland Ladies Choir who this year are celebrating 40 years of singing. Neyland twinned with Sanguinet in 2013 and since then there have been many exchange groups and visits. 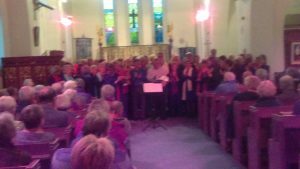 The concert was a great success and was introduced by the the Vicar of Llanstadwell, the Rev Alan Chadwick while the accompanist was Mr Peter Griffiths. The mayor, Dr Simon Hancock, who is also the president of Neyland Ladies Choir gave a vote of thanks to both choirs. Afterwards a meal was shared in St Clement’s Church Hall before the choir flew back to France. This entry was posted in Community news on April 30, 2017 by admin.